<posted February 26, 2015> This is the daylily, H. 'Empire of Desire' and it was the most photographed flower in the yard last summer. Another one of my photos of it was recently featured on the back cover of the Daylily Journal. I just love this cultivar. You can find it here. Each year I always kick off my creative juices by finishing the family scrapbook from the previous year. Well, that worked great until January 2011, when I was consumed with life and the possibility of the impending (and ultimate) move to Illinois and I didn't get our 2010 family scrapbook done. We moved in August 2011, and sad to say, I didn't get 2011 done, and here I am with 2013 or 2014 not done, either. "Years behind" is a big deal to someone who for five years documented our memories almost as fast as we created them. I am so proud of my scrapbooks. When Carter graduates high school, or when he gets married, or when he shows up on an episode of “Cops,” I will have volumes of ready-made photoautobiographies. Thanks, mom. You’re the greatest. So back to the obsessive scrapbooking part. Over the holiday break I finished the 2010 family scrapbook, finished scrapping 2nd and 3rd grade and got really far into completing 2011. It was a very busy two weeks. 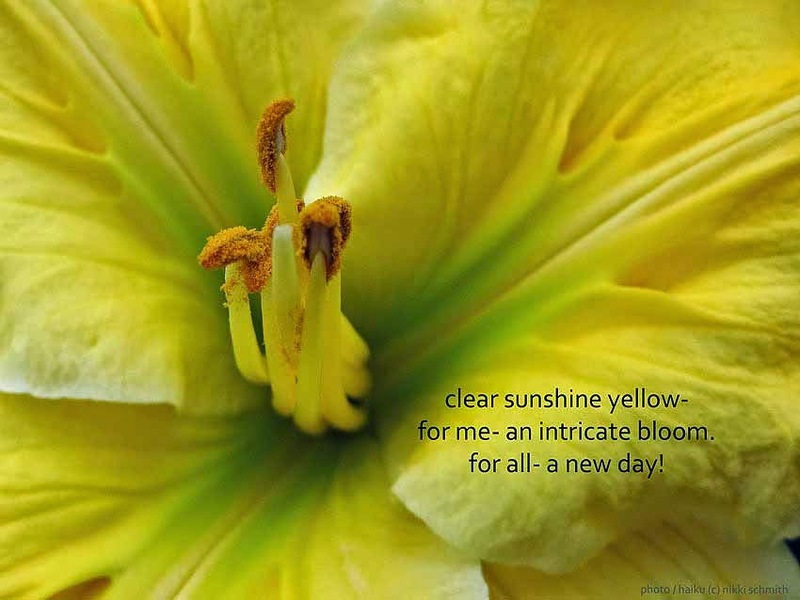 I also organized ALL of the photos I took last summer and deleted the less-than-spectacular ones, and chose 50 prime photos to be used for Daylily Haiku Thursday this year. The goal is to put out a full 50 in 2015 and publish the e-book of the haiku archives. I'm excited for the possibilities. The hard part was simply getting started. But once I had momentum, it was like butter. The warm weather at the end of October and early November at the end of last year allowed me to plant these new purchases you see below living on my patio in pots most of the 2014 late summer...and enjoy a third rebloom of Heidi Douglas' 'Blonde on the Inside' which I adore even more now that it is a consistent rebloomer. I also enjoyed the late-feeding finches and the last of the monarchs and skippers flitting about the yard. 'Unforgettable Wonder' also rebloomed in late October and the edge was just as sparkly then as it was when it bloomed first in June. This is a wonderful cultivar from Herbie Phelps. All of this feels like yesterday, when spring seemed like a lifetime away - but here I am now, getting ready to flip the calendar to March. Wow. As you can see, I've been doing a lot of reflecting. I get many questions about how I got "into" daylilies. The story is always the same. I told it here in one of my first posts six years ago. Let's think about that first time you saw hybrid daylilies. Did you admire a neighbor's yard before striking up a conversation about their garden? Were you bustling through the mall or library when you stumbled on a daylily show or sale? Did you crack open the internet and accidentally discover the daylily world? We can all remember "that" moment. Your eyes widened, your left-brain shook as your right-brain filled the trunk of your car with possibilities. However it might have occurred, you're here now, with the rest of us, wondering how you dug this rabbit hole, how much you have spent while you have been here, and what happens next. I know I am. Daylilies are part of the fabric of my life. A few thousand people visit the blog each month to see what I'm up to, my Facebook feed is full of flowers, my Inbox is a constant stream of questions, support and discovery. I travel thousands of miles each year searching out new collections, exhibiting in shows and sharing my daylily adventure. My closest friends, those who might know my green heart the best, are daylily friends. Some of them only exist in my daily life electronically, or in my snailmailbox - their handwriting offering a hug on a day when I need it most. I discovered the whole of daylilies much like I discovered the layers of music. My tastes in music today are rooted in my early exposures - The Doors, Genesis, Jethro Tull, Led Zeppelin - which floated from my dad's garage and filled my summer days. I can remember devouring Fleetwood Mac's studio album in 1987 -Tango in the Night. It was the first time I bought a 33 with my own money, took it home, and listened to the entire thing in one sitting - letting the landscape of the tracks take me on a journey - appreciating the highs and lows, the fasts and slows, coming to an end with the last track on side 2 that still haunts me. Daylilies aren't much different. The first ones - the thick substanced polychromes with saturated colors that make my heart flutter - shape my tastes in daylilies today. I wonder if I would have been enamored instead first with the lilting shapes and finer textures of H. 'Miss Jessie' or H. 'Kindly Light', my garden wouldn't be overflowing with spiders and unusual forms. I often wonder how I got here and where I might be if I weren't. But I am sure glad you're here with me.